Question and Answer tips: Questions can demonstrate whether your audience understood the material and whether you have communicated the idea, or concept, efficiently. In a smaller group questions can be handled during the talk, in larger groups it is often easier to designate a time for questions afterwards. Define the parameters of the question and answer session. “Please keep your questions short and on topic.” Clarify how much time is available for Questions and Answers in the programme. Repeating the question allows you time to contemplate the answer. It also allows those who did not hear the question to understand what was asked. This is particularly important when there is no microphone. Repeating the question allows clarification of what was asked. Some questions come out muddled. Repeating back the question allows for some clarification. It is essential to ensure that you have correctly understood the question. If you are asked a question that you don’t know the answer to there a few easy things you can do. As human beings we cannot know the answer to every question, even if we want to. The first is ask the audience. In any audience there are those with more experience or understanding of certain concepts than you as the speaker. “Can anyone give a suggestion on how this question can be answered?” This is also a great way to allow the audience to apply what they have learned to a practical example (when you do know the answer). If you don’t know the answer, and asking the audience has yielded no insight, you can also say “That’s a great question. I don’t know the answer to that, I will find out and get back to you.” Make sure you do get back to them. The worst thing to do is to make something up, or try bluff (the audience will know). We sometimes feel that as we’re the expert, that we should know the answer to everything asked of us. Audiences tend to appreciate honesty. Following up on the question later with an answer (via email or blog post to the organiser/questioner) can help build your credibility and brand as a knowledgable and professional speaker. Handing out three-by-five inch cards and encourage participants to write down their questions during your presentation can help streamline the Q & A process. Get a helper to collect them while you are summarising your talk. You can choose to skip or modify loaded questions as needed, or even exclude those you don’t want to answer. Close with a summary of what was learned from the Q & A session and your key points. The leaves a stronger impression than closing on someone else’s question. Your audience expects you to be confident and to maintain control of the session. Often when the Q&A session goes “pear shaped” it’s because the speaker has lost control and gone off point (the point of the talk). Audiences may form a negative impression when the speaker reacts emotionally, but leave with a positive impression when you remain calm, confident, and in control. This session is meant to help embed the ideas with your audience and increase utilisation of these ideas. If you really want to get your presentations right, manage Question and Answer sessions wit aplomb, become a better speaker or presenter consider hiring a professional presentation consultant to help. A professional can help you get perspective about what’s important, help you protect your brand and deliver clear powerful visuals which augment your message. 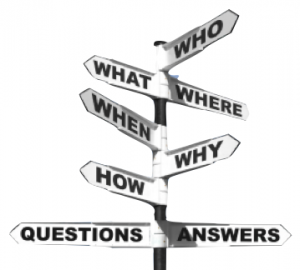 If you need help running a Question and Answer session contact us today.